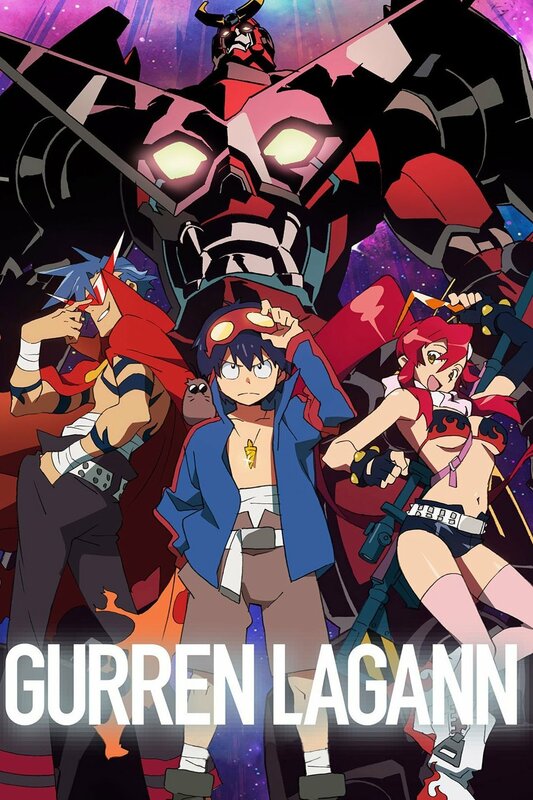 Gurren Lagann was first aired in 2007. It revolves around Simon a young digger boy from the underground village of Giha. Almost everyone views him as a weakling and the only person who he can turn to is his best friend Kamina who is notorious throughout the village for being a troublemaker who only dreams of living above the ground. Simon discovers a strange object shaped like a drill and a metal face belonging to a that has been lost for many years. Then one fateful day a giant monster called a beast man crashes through the roof of the cave engaged in combat with a mysterious girl. The girl introduces herself as Yoko a villager from a neighboring village. Together the trio defeat the invader and set out on a quest to liberate the surface from the beast men. My Review: I have never been a fan of mech animes, in fact, I find them to be quite underwhelming. However, in the case of Gurren Lagann it a different story. For a majority of the first few episodes, the show is all about the characters and less about impossibly big robots, that comes later. We a brought into this anime with a VERY colorful cast of characters ranging from the whiny main character, the slooty warrior chick and the most lovable knuckle head of all time. The first half focuses on the group’s struggle for freedom and the second half deals with the result of their actions. Apart from the fights with giant robots the second half deals with some strong political turmoil, it was something that I had not expected when going into the show. Needless to say, I was pleasantly surprised by what I saw. I did feel like it got a bit out of hand towards the end with the fights but I was able to look past that fact. One thing to note was that the ending did leave much to be desired but it was the only ending that seemed to fit. The soundtrack was used considerably well and really added to the atmosphere of particular moments.